The book aims to fulfil two distinct but complementary functions. For those new to the Tarot, it gives complete instructions on how to successfully use the cards. 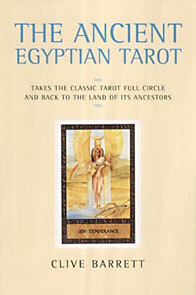 Those with more experience of the Tarot will find an explanation of the background, the thoughts and ideas behind the Ancient Egyptian Tarot. The cards of the Ancient Egyptian Tarot have been designed from their very conception to be usable by both the novice and the experienced reader. Each card is fully illustrated, and so not only more satisfying for both the reader and the subject but also readily accessible to the beginner. The titles and sequence of the Major Arcana follow that of the Rider-Waite Tarot, and the practiced user will find deeper symbols contained within the illustrations. out of stock - please enquire.